Cimbasso Beautiful brass inst Mix between Tuba and Trombone Very lyrical sound. Cimbasso &###xA0;——- Bass Trombone/Tuba &###xA0; &###xA0; Professional Model &###xA0; &###xA0;&##xA0. Instrument is new-mint-never played. 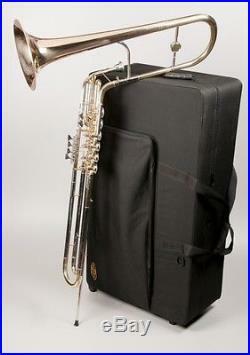 The cimbasso is an instrument, any serious orchestral tuba or Trombone player will want to add to their collection. This is serious fun! &###xA0; And more and more opportunities are becoming available for the cimbasso in film, jazz repetoire etc….. &###xA0; &###xA0;Be prepared! The cimbasso was originally an Italian instrument specified by Verdi and other Italian opera composers to be used as the bass voice for the brass in the orchestra instead of a tuba. But I have heard some great jazz played on this horn and it gives a great blend to trombone ensembles! 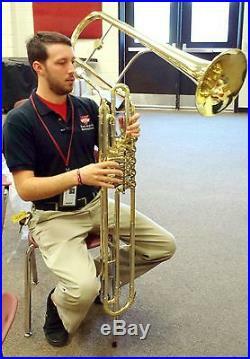 Cimbasso Verdi Bass Trombone. The rotary valves and linkage are extremely well machined and crafted, smoothly operating and so quiet. This also includes the trigger linkage on the 5th valve. All of the slides are nickel silver and are beautifully and precisely lapped for a smooth draw. Bore: 0.725&###x2033; (18.5mm). Bell: 10&###xBE;&###x201D; (270mm). 5 rotary valves with tuning trigger. Weight: 9&###xBC; lb (4.2kg) In case:&###xA0;39&###xBC; lb (17.8kg). Case size: 104 x 35 x 36cm &###xA0;Heavy duty, wheeled. 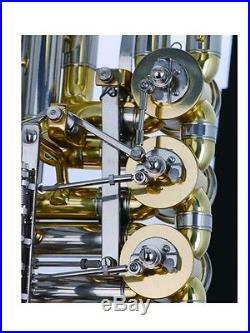 Nickel silver inner and outer tuning slides. O’Malley cimbasso&###xA0;mouthpiece. &###xA0;&###xA0; &###xA0;Below is a video of a general example of what a cimbasso sounds like. The O&###x2019;Malley Difference. &###xA0; O&###x2019;Malley Instruments is an American family owned business with a lifetime around music education and music performance. &###xA0; O&###x2019;Malley Instruments is not a huge conglomerate where you will just be one of thousands of horns going out. &###xA0; Every horn is tested for correct adjustment and playability. &###xA0;&###xA0; Parts are available from O&###x2019;Malley for every instrument in our catalog. &###xA0;Value is the key word at O&###x2019;Malley Music Instruments. &###xA0; Our mission is to offer the highest quality instrument at the lowest possible price to make quality musical instruments to available everyone. &###xA0; The owner of O&###x2019;Malley Musical Instruments has been a major supporter of the arts in his hometown for decades. &###xA0; Don&###x2019;t be a number at some foreign company&###x2026;&##x2026.. Be a name to your friends at O&###x2019;Malley Musical Instruments! Currently our instruments are being used all over the world by students and educators, as well as professional performers who depend on their instruments to make a living! Parts are available from O&###x2019;Malley for every instrument in our catalog. &###xA0; Other Brand instruments&###xA0; will be stated in Co. To supply the finest Instruments at any performance level, from student to professional, at an incredible value. See our other items. 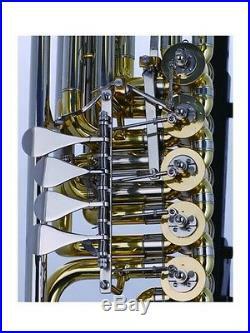 And more and more opportunities are becoming available for the cimbasso in film, jazz repetoire etc….. Cimbasso Verdi Bass Trombone The rotary valves and linkage are extremely well machined and crafted, smoothly operating and so quiet. O’Malley Instruments is an American family owned business with a lifetime around music education and music performance. O’Malley Instruments is not a huge conglomerate where you will just be one of thousands of horns going out. Every horn is tested for correct adjustment and playability. Parts are available from O’Malley for every instrument in our catalog. Value is the key word at O’Malley Music Instruments. Our mission is to offer the highest quality instrument at the lowest possible price to make quality musical instruments to available everyone. The owner of O’Malley Musical Instruments has been a major supporter of the arts in his hometown for decades. Don’t be a number at some foreign company…&hellip.. Be a name to your friends at O’Malley Musical Instruments! The item “Cimbasso Beautiful brass inst Mix between Tuba and Trombone Very lyrical sound” is in sale since Monday, May 15, 2017. This item is in the category “Musical Instruments & Gear\Brass\Trombones”. The seller is “dmaley” and is located in Douglas, Georgia. This item can be shipped worldwide.